It's Apple iWatch speculation time again, and this time the well-respected New York Times tech blog has lent its voice to the growing feeling that something is in the works. The NYT's Nick Bilton claimed that, according to people familiar with the matter, the iPhone-maker is currently experimenting with a smart watch made from curved glass. 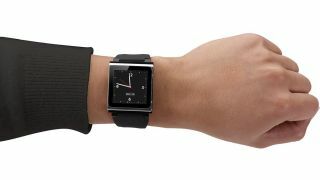 The iOS-based wearable device would curve neatly around the user's wrist, a form-factor Apple is said to be relying on to set it apart from competition believed to be coming from Google and, of course, the existing Pebble Smartwatch. "Such a watch would operate Apple's iOS platform, two people said, and stand apart from competitors based on the company's understanding of how such glass can curve around the human body," Bilton wrote. Siri and Maps on board? The blog speculates that the watch could include Apple's Siri personal assistant, as well as a Maps app to offer walking directions as users walk down the street. It could also be used as a health monitor, or to make mobile payments using Apple's Passbook software, Bilton adds, but this appears to be educated guesswork rather than information from sources. Previous speculation regarding the so-called iWatch has suggested it could be used to answer calls, read emails, messages and social networking notifications. According to the report, the curved glass could be provided by Gorilla Glass-maker Corning. The company recently claimed it had succeeded in a ten-year mission to create bendable-yet-strong glass, it calls Willow Glass. "You can certainly make it wrap around a cylindrical object and that could be someone's wrist," Corning's chief technology officer Pete Bocko told the paper. "Right now, if I tried to make something that looked like a watch, that could be done using this flexible glass."